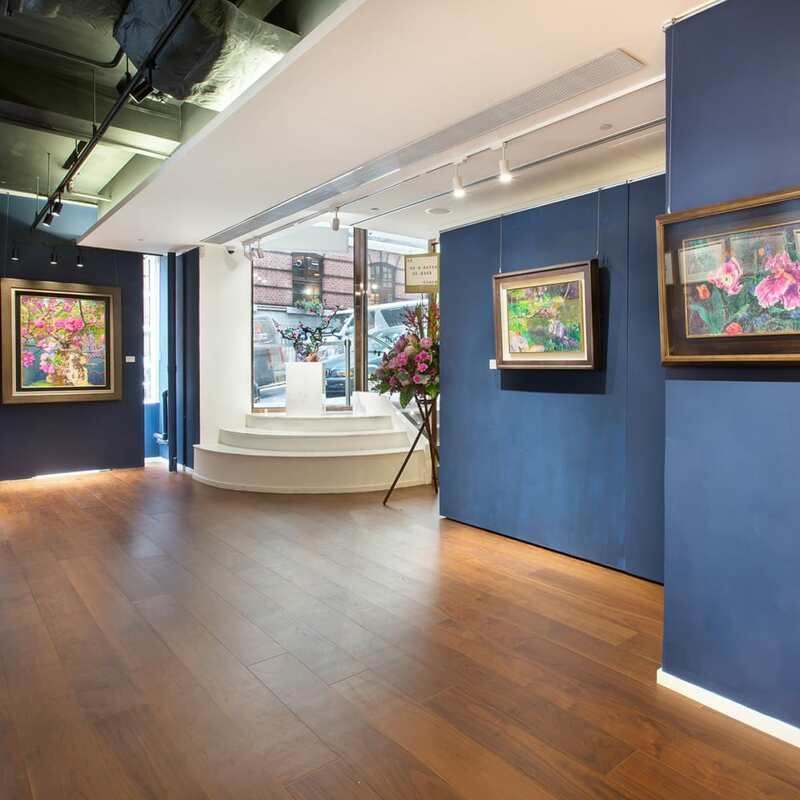 Amanda Wei Gallery is proud to announce "Peach Blossoms" - the solo exhibition of renowned Chinese artist Zhou Chunya. The exhibition will showcase multiple artworks in different media by the artist: two oil paintings, one colored bronze sculpture, five pieces of acrylic on paper, one piece of color pencil on paper, and five pieces of charcoal on paper - which is a rich and complete artistic presentation. All the themes, images and colors of Chunya’s paintings are created in the first person with a strong autobiographical nature: sensitive heart, willful imagination, and spontaneous powerful presentation of subconscious expression desire. Perhaps this is the first meaning of “innocence”. Since the mid-1990s, from the “Green Dog” to the “Red Man”, he has established a distinctive color pedigree in which color and theme integrate perfectly by the means of deeply hidden rhetoric. In the peach blossom series, he conveniently uses this color atlas to match the natural landscape and consequently achieves the autonomy of color. His color is a dynamic language with force and speed, which intensifies contrasts and conflicts. The brilliant colors speed up the rhythm, and the stimulant color sensations respond to the strong expression desire. The dynamic interplay of colors and lines in his paintings finds a new way in color expression. Every peach blossom in full bloom is the convergence of nature and inspiration, is the luxury and glory of life, and is the overlaying image of the poet's phantom, so brilliant and dazzling to the eye. Chunya’s ability in absorbing and transforming the traditional literati writing language obviously surpasses his peers. Instead of making a one-way and passive transfer of traditional forms, or getting obsessed with the traditional taste, he engages in an in-depth integration and transformation, and his focus is on the blending of ink and color of the traditional literati painting and the reconstruction of its brushwork. Chunya understands that the quintessence of painting language is not precision, but the flexible and the seemingly ambiguous areas where extra efforts should be invested. However, what he expects are not accidental new findings of painting texture, but rather the mysterious and brilliant expressions with solid strokes and strong rhythms. The contradictory strategies, such as overcoming the hard with the soft, handling the complex with the simple, and acquiring the thick with the thin, are consciously employed by Chunya in his paintings which succeed in fusing the delicate, sensitive and mysterious qualities Chinese traditional literati paintings into the completely new expressions. Zhou Chunya’s excellence does not come from inheriting certain traditional pattern or taste; on the contrary, his achievement is the breakthrough and transcendence of the traditional aesthetic principles. He is more concerned with how the ancient forms of brush and ink should be passed and extended in the present. Taking a high ground, he transcends the gentle traditionalists as he reforms the old traditional patterns and brings into them amazing vitality. In his paintings, peach blossoms become numerous incarnations. Instead of relying on building volume and space, he knows the essence of the literati painting and implies the transfer of space and structure with subtle brush strokes and rhythms, achieving the effect of resemblance through dissimilarities. Paying special attention to the manipulation and tailoring of object images, Chunya’s paintings go beyond the objective reality and strengthen the symbolic meanings. Of course, the peach blossom in his works is a metaphor or a symbol related to passion and to catharsis in the wake of deep obsession. The theme of peach blossom has been interpreted in the paintings of Zhou Chunya to the point of "no meaning being left." Just like Han Gan’s horses, Wang Mian’s ink plum blossoms, and Monet’s water lilies, all the cases show how an image, a scene or a theme is monopolized by one person. "After spring wind and spring rain, I would go wherever the water flows." Peach blossoms have waited for a thousand years, and then on a bright early spring, they brought all inspiration to Zhou Chunya and found expression of their blooming beauty in his paintings.